Here is a picture of my Olson 25, hull #14, Grey Dawn, formerly Valkyrie from Santa Cruz. This pic was taken in the Possession Point Race in March in Puget Sound (PHRF). I was the only Olson 25 in the race. Please give photo credit to Kelly O’Neil Photography, Auburn, WA. 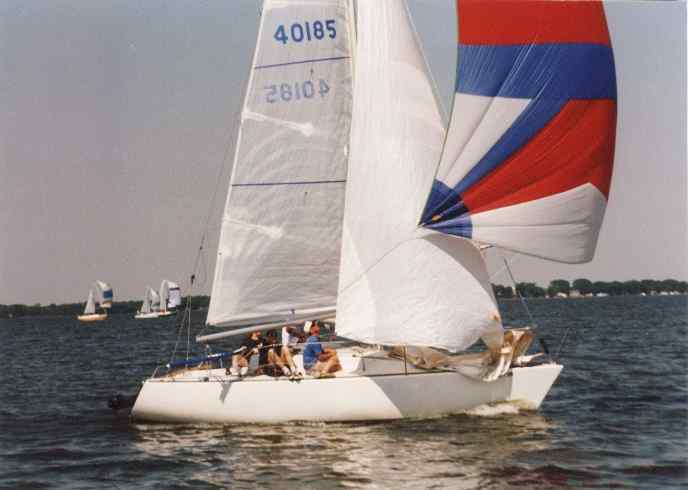 Attached is a picture of my Olson 25 "Vanishing Point" in the 1997 "TransWinnebago Race". We race the length of Lake Winnebago in Wisconsin which is 28 miles. We were first to finish and correct out to 2nd overall by a slim margin. Its a 1984 boat and I just found out that I can look up a hull number. The boat is in the barn so it will be a while. We won the Fond du Lac overall trophy this year. I have two new sails on the way and a few other improvements to do. It is an extremely fun boat to sail and race and we are really starting to ‘get the hang of the boat’ lately. I look forward to more good times this coming season. In the TransWinnebago, we flew a staysail for almost half the race and thought it gave us an extra 1/10 of a knot or so. Thanks for all the info on the web site. 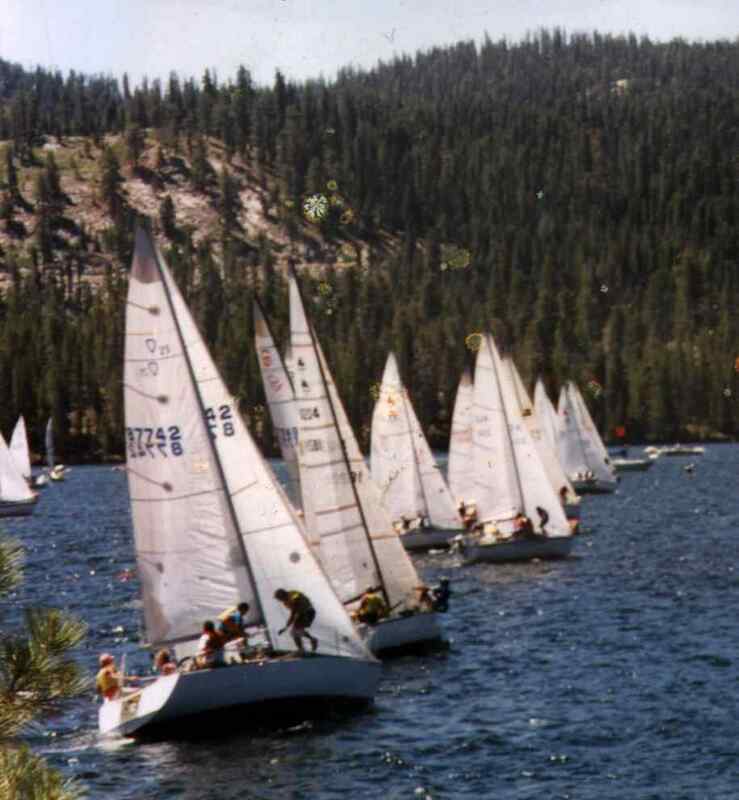 Here are a couple of images ( click here for Starting line shot ) from 1997 High Sierra Regatta. We won the PHRF A division this year. We had a fleet of about 15 boats varying from Santana 525's to an Olson 29. Actually the Olson 29 is now owned by a former Olson 25 owner, Bob Farmer. 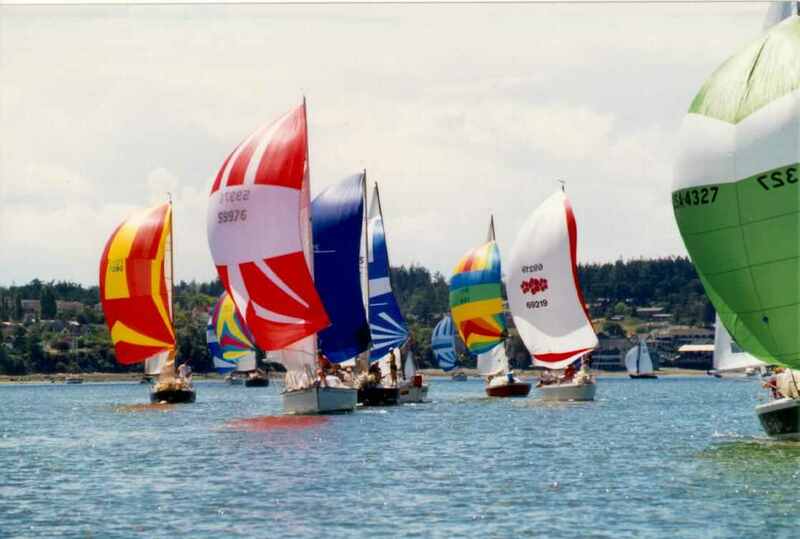 There were three O25's at Whidbey Race Week '97. 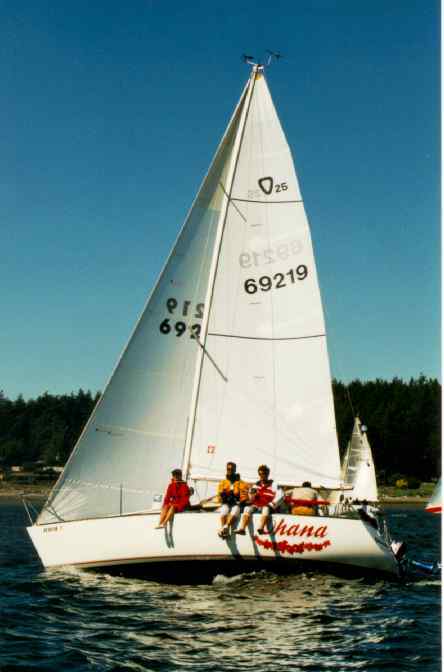 "El Kabong" ex "Siva", "Tricks" out of Portland, and "Ohana" ( Picture click here) from Corvallis, OR. This was the first year "Ohana" has had a good measure for performance. As you can see by the attached results[working on it. ed. ], without the direct competition, it would be very difficult because of the differing performance vs. wind speed. The O25 is definitely better in heavy air. We cooked the fleet in the final (Thursday) race in 17+ knots. The attached pictures were taken by Kelly O'Neil, Professional photographer from the Seattle area [ed: Pictures in this story are published on the web with the photographers permission. Kelly can be contacted at (253)833-8126. Based in Seattle, she provides a full range of professional photography services all over the west coast, including racing photos]. The picture ( Click here ) shows the J-24, "Zib-Zib" (green spin), then a Capo 26 (red w/white spin), O25 "El Kabong" (all blue spin), O25 "Ohana" (white w/red flowers spin), then an S-2, a SC-27, and a Martin 242, etc. Anyone interested in doing Nationals up there next year? Ether that, or I'm coming to the Bay. It's really hard to know how you are progressing with PHRF. The weather was really against the O25's. Monday's races were cancelled because of light winds. Tuesday through Thursday, the wind made a steady increase from about 6kts to over 15kts. Friday was a bust again, but we had one hell of a water fight! This really is summer camp for adults! At Whidbey, "El Kabong", "Tricks", and "Ohana" had a bet going for the best finish for the week. "El Kabong" got the bottle of champagne! PS: Also, 48&deg;North had a picture of an Olson 25 on the front cover for the August issue that was done by Jim DeWitt. It was really GREAT! Read about the two Olson 25's that raced to Hawaii. Send us your story and we will publish it. 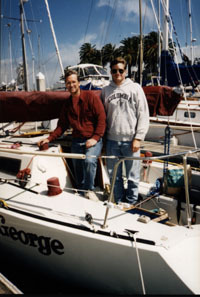 On Monday, July 11th 1994, two Olson 25's departed San Francisco Bay and set sail to the west. After 2070 miles of open ocean, they reached their destination, Kaneohe Bay, Hawaii. They were taking part in the eighth running of the biennial West Marine Pacific Cup. This year 51 boats finished the race ranging in size from a 70 ft racing sloop down to, you guessed it, 2 Olson 25's; and they did pretty well: "Siva" a modified Olson 25 skippered by Gal Bar-or and navigated by Carlos Badell, finished first in their fleet, 3rd overall and 3rd in the doublehanded division. They finished the race in 12 days 19:53:36. By my calculations, that is about 6.7 knots average speed. "George" a stock Olson 25 skippered by Craig Douglas and navigated by John Koper finished 5th in fleet, 15th overall and 6th in the double handed division. They completed the race in 13 days 6:41:41. That's about 6.5 knots average. Daily distances for the two boats ranged between 120 and 200 miles per day. I have asked both skippers to write an article for the newsletter, at press time, Craig was busy catching up in his private and professional life due to the race and preparation. Gal Bar-or's article is below. Being awfully curious and being that Craig keeps "George" barely 40 feet from my own boat, I have some preliminary scoops. Preparation started at least 6 months before the race by fixing all those minor bugs that we all say we will fix "next" weekend. They had to learn Celestial Navigation and take daily fixes... ugh! too much homework! They also had to get the laptop to receive weather faxes over the radio. They built an emergency rudder, added 2 solar panels for power on the stern pulput, and insulated the backstay so it could be used as an antenna. They painted the bottom and bought a trysail and storm jib. Other than the added safety equipment and electronics, the boat is pretty much the same as it was while racing on the bay. One weekend Craig asked me if he could have a section of my "pretzeled" spinnaker pole that I had lying around my trailer. He took it as an emergency splice in case his pole broke (a foot long section was cut once lengthwise so it could be hose clamped to the broken spar). Hey Mom, part of my boat sailed to Hawaii! The day before the start, I caught Craig and John at the boat doing last minute prep and snapped the photo you see here. I took a peek belowdecks and saw the gear hammocks with laptop computer and other stuff. Freeze dried food and water for the whole trip was stowed out of sight. They seemed confident and I wished them luck. During the race, I was able to follow their progress over the Internet electronic mail news group, getting almost daily positions and standings. After the race, the Olson 25's along with a whole bunch of other boats were placed on their trailers on a ship and sent back to San Francisco. The ship was chartered for the race and the trailers had to be dropped off in Oakland two weeks before the start of the race. I heard figures in the neighborhood of $4000.00 per boat for this arrangement. It sure beats slogging it back through 2070 miles almost all against the wind. A few weeks after the race I gave Craig a call and talked to him about the race. In the limited time we had, I garnered the following info. The race began in normal SF Bay area weather and the boats had to beat into a headwind for a number of days. Thereafter, the wind went behind the beam and stayed mostly 20 to 30 degrees forward of dead astern. The weather was overcast for most of the race, which lead to pitch black nights. Craig said there weren't many cues to go by at night, just the compass and masthead wind indicator. He said the waves were hard to see and could sometimes catch you off guard. After four hours of staring at the compass (Craig admitted it had bad lighting) you get a little confused and disoriented [not to mention being up at 4 in the morning. Ed.] Craig said that they felt secure and confident in the boat and that the boat didn't suffer much during the trip. The Olson 25's short waterline makes for good surfing near the shore, but out in the bigger ocean waves, it was harder to get the boat to surf. My hat is off to all who took this voyage, it took courage to venture out to sea in such a small boat. Some may call it insanity, but I somehow envy them. Yes, we took an Olson 25 to Hawaii; Yes, we went double handed; But no, we were not alone! The first days, as expected, we were wet, and not very happy. We cracked off as soon as we got away from the shore (about 50-75 miles). Being on deck was easy, but going below, as we found out quickly, in heavy air (20-27 knots) and large waves, is not pleasant. Carlos, my partner and master navigator, and I were in the process of expunging our lunches when we realized that eating was not a useful way to spend our time. Personally, I found that face down on the bunk was much easier than eating, or for that matter, anything else. Into the twilight of the first day, the dolphins found us, and escorted us off-shore. I soon found that there was a direct relationship between our point of sail, and how happy I was. I was relieved to finally put up our blast reacher, and joyous to set our spinnaker. Carlos & I traded 3 hour intervals during the day, and 2 hour intervals after dark. We both found the early dark hours of the morning difficult, simply because our eyes were too tired to focus on the compass. Some say that the knot meter is a fun-meter; others say it's just a macho thing for men. Personally, I love to see how high we can make it go... in fact, we got it as far up as 17.9 several times, sustaining speeds of between 14 and 16 knots! call it what you like, but an Olson 25 at anything more than 12 knots gets hairy, and downright fun! Luckily, we suffered absolutely no breakages or problems of any kind during the trip. This is due in no small part to Carlos' extensive ocean experience in preparation of the boat. Sometimes I wished we could just rest a bit, but Carlos was relentless.. full checks of every visible rigging item, once or twice a day, constant changes in halyard position, and more. Before we left, Carlos was concerned about pumping the somewhat unstable deck-stepped mast; a quick call to Buzz Ballenger confirmed his suspicions, and the day before the race he installed a set of runners. Maybe we needed them, and maybe we didn't, but the added confidence helped us feel safer in pushing the boat to its limits. I feel lucky that Craig was with us on this trip. He kept us pushing hard, constantly a threat, a worthy adversary and a good sailor. I also feel that great credit is due to the boys on Roadhouse Blues, the Hawkfarm. They cost us more sleep that anything else on the trip, pushing us hard day and night. Carlos said we would be bouncing our way to Hawaii in our short, fat little boat. He said that there would be times when I'd be driving in pitch black night, surfing down monster waves with water hitting the spreaders. He was right. There were times when, looking around at the absence of land, that I doubted our sanity; but every sunset, every moonlight night, every sunrise, and every moment shared with a partner, made this trip what it was: the best adventure of my life... so far.